UCOG Today [Paul Kieffer] » Blog Archive » Gender communication gap? Ever hear the opinion that women tend to talk more than men? Once I heard that all you need to know about this claim can be learned by watching a group of ladies who meet for coffee or tea in comparison to what the situation is like when a group of men socialize. Someone seems to believe that the activity on social networks will also provide an answer to the question. 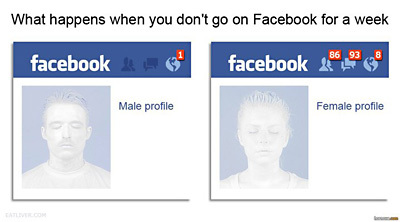 It seems that the person who came up with this graphic believes that women might be a bit more prolific than men at communicating on social networks. If you have several common friends on Facebook and can’t keep up all the time, just ask one of your lady friends what is happening. Most likely she can fill you in.